I can't get enough of all the marble accents I'm seeing lately. When I first started dreaming of decorating our new home I had visions of marble and metallic dancing in my head. In reality my choices have been surprisingly traditional but I'm determined to incorporate a few fancy marble accents. I love that you can find real marble objects at affordable prices. 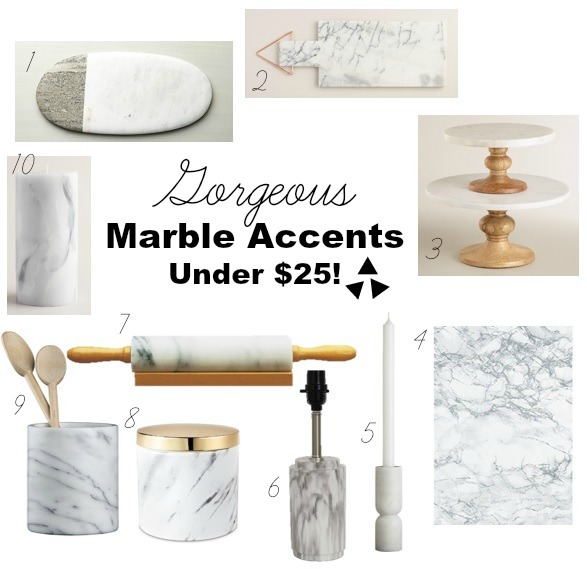 Here are some of my favorite marble finds for...wait for it... UNDER $25. In fact prices start at just $7. *make anything marble with this fabulous marble contact paper! Note: affiliate links included. Which piece is your favorite? Pretty sure the pedestal stand is going to find its way into my home.